Morenci Copper Mine, Arizona. Map and News. Elearning. 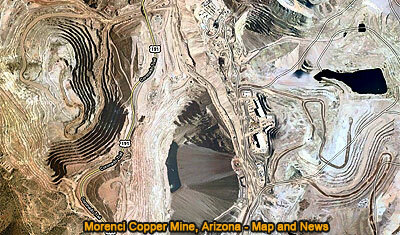 Explore the geometry of Morenci Copper Mine, Arizona through detailed Google satellite imagery. To Pan: click and drag the map. Take advantage of the zoom bars. Morenci is an open-pit copper mining complex. in the Southeast Arizona, about 50 miles northeast of Safford. Morenci is one of North America's largest producer of copper and one of the largest open-pit mines in the world. Source: Wikipedia, Copper mining in the United States. Retrieved 2015-09-29.